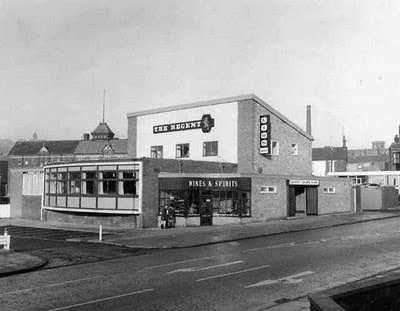 Not as old as some of the images on this blog, but I really like this photo of The Regent. There was a time in the mid - late 1970's that I was going in there every night but Tuesday & Wednesday. Thursday, they would have a guest band (Shabby Tiger or someone similar), then Friday, Saturday & Sunday, they would have one of the regular, resident bands (Forever or Thunderbird Sabden), then the best night of all was 'Musicians Night' on Monday night. Forever would normally host it and anyone could get up and do a stint, either alone or with the band. Some really excellent musicians would get up and do a turn, which usually turned into a 20 minute blues jam. For a few years, when they turfed you out of there at 11:30pm, you could then cross the road, pay a quid into the 'Underground' in the basement of the Waterloo and be deafened for another 3 hours. That off premises, Wines & Spirits part of The Regent didn't last long. It was hired out to a bloke that dealt in white goods, for years and years. I went with my dad to get my mum a new spin dryer from there. There was a revolving door just inside that front entrance. Hours and hours of fun, for drunks on a Saturday night, I'll bet. On the left, over the roof of Meadowcroft's old place, you can see St James Church, in the far distance. Then just out of sight, behind the living quarters of the pub, would be the Salvation Army Hostel, on the corner of John Street. Apart from the road in the foreground and St James Church, everything else in view has gone. The Benefits Agency, or whatever they're called now occupy the plot. It was The Swan Brewery Darren. I grew up around there (born 1958) and played in the derelict brewery. It was bordered by Larkhill St, Moor St/Mount Pleasant, Smithies St and Larkhill itself roughly, so on the plot that is now the Larkhill Health Centre and the landscaped greenery that surrounds it. My next posting is going to be a small feature on that very brewery. I've just been sent a photo of a very rare tray from the brewery. Hopefully going to get the posting 'live' within a fortnight, if I can find the time.